Printing is a process for reproducing text and images using a master form or template. The earliest examples include Cylinder seals and other objects such as the Cyrus Cylinder and the Cylinders of Nabonidus. The earliest known form of woodblock printing came from China dating to before 220 A.D. Later developments in printing include the movable type, first developed by Bi Sheng in China, and the printing press, a more efficient printing process for western languages with their more limited alphabets, developed by Johannes Gutenberg in the fifteenth century. 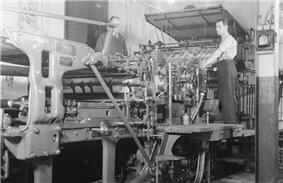 Modern printing is done typically with ink on paper using a printing press. Its also frequently done on metals, plastics, cloth and composite materials. On paper it is often carried out as a large-scale industrial process, and is an essential part of publishing and transaction printing. 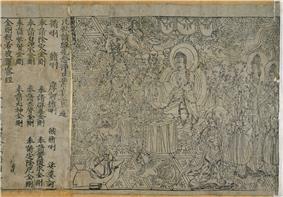 By the ninth century, printing on paper had taken off, and the first extant complete printed book containing its date is the Diamond Sutra (British Library) of 868. By the tenth century, 400,000 copies of some sutras and pictures were printed and the Confucian classics were in print. A skilled printer could print up to 2,000 double-page sheets per day. Printing spread early to Korea and Japan, which also used Chinese logograms, but the technique was also used in Turpan and Vietnam using a number of other scripts. This technique then spread to Persia and Russia. This technique was transmitted to Europe from China, via the Islamic world, and by around 1400 was being used on paper for old master prints and playing cards. However, Arabs never used this to print the Quran because of the limit of Islam doctrine. Block printing, called tarish in Arabic was developed in Arabic Egypt during the ninth-tenth centuries, mostly for prayers and amulets. There is some evidence to suggest that these print blocks were made from non-wood materials, possibly tin, lead, or clay. The techniques employed are uncertain, however, and they appear to have had very little influence outside of the Muslim world. Though Europe adopted woodblock printing from the Muslim world, initially for fabric, the technique of metal block printing remained unknown in Europe. Block printing later went out of use in Islamic Central Asia after movable type printing was introduced from China. Block printing first came to Europe as a method for printing on cloth, where it was common by 1300. 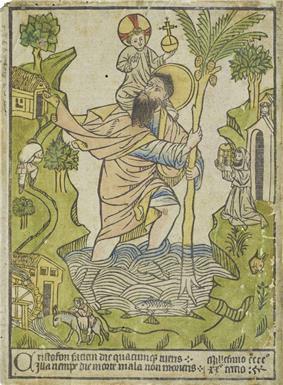 Images printed on cloth for religious purposes could be quite large and elaborate, and when paper became relatively easily available, around 1400, the medium transferred very quickly to small woodcut religious images and playing cards printed on paper. These prints were produced in very large numbers from about 1425 onward. Around 1040, the first known movable type system was created in China by Bi Sheng out of porcelain. Sheng used clay type, which broke easily, but Wang Zhen later carved a more durable type from wood by 1298 C.E., and developed a complex system of revolving tables and number-association with written Chinese characters that made typesetting and printing more efficient. Still, the main method in use there remained woodblock printing (xylography), which "proved to be cheaper and more efficient for printing Chinese, with its thousands of characters". Copper movable type printing originated in China at the beginning of twelfth century. It was used in large-scale printing of paper money issued by the Northern Song dynasty. Movable type was spread to Korea during the Goryeo Dynasty. Around 1230, Koreans invented a metal type movable printing using bronze. The Jikji, published in 1377, is the earliest known metal printed book. Types-casting was used, adapted from the method of casting coins. The character was cut in beech wood, which was then pressed into a soft clay to form a mould and bronze poured into the mould and the type was finally polished. The Korean form of metal movable type was described by the French scholar Henri-Jean Martin as "extremely similar to Gutenberg's". 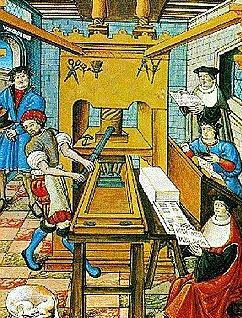 East metal movable type was spread to Europe between late 14th century and early 15th century. 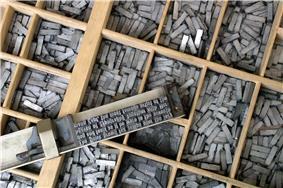 Around 1450, Johannes Gutenberg introduced what is regarded as the first modern movable type system in Europe (see printing press), along with innovations in casting the type based on a matrix and hand mould. Gutenberg was the first to create his type pieces from an alloy of lead, tin, and antimony – the same components still used today. 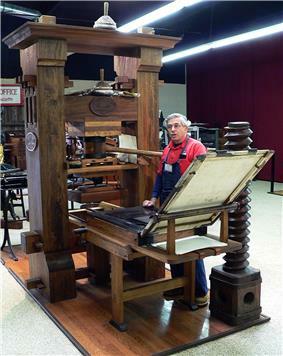 Compared to woodblock printing, movable type page setting and printing using a press was faster and more durable. The metal type pieces were sturdier and the lettering more uniform, leading to typography and fonts. The high quality and relatively low price of the Gutenberg Bible (1455) established the superiority of movable type for western languages, and printing presses rapidly spread across Europe, leading up to the Renaissance, and later all around the world. Today, practically all movable type printing ultimately derives from Gutenberg's innovations to movable type printing, which is often regarded as the most important invention of the second millennium. Offset printing is a widely used printing technique where the inked image is transferred (or "offset") from a plate to a rubber blanket, then to the printing surface. When used in combination with the lithographic process, which is based on the repulsion of oil and water, the offset technique employs a flat (planographic) image carrier on which the image to be printed obtains ink from ink rollers, while the non-printing area attracts a film of water, keeping the non-printing areas ink-free. Intaglio - Used mainly for high value documents such as Currencies. Thermal printing - Popular in the 1990s for Fax printing. Used today for airline baggage tags and in Supermarket deli counters. Gravure printing is an intaglio printing technique, where the image to be printed is made up of small depressions in the surface of the printing plate. The cells are filled with ink and the excess is scraped off the surface with a doctor blade, then a rubber-covered roller presses paper onto the surface of the plate and into contact with the ink in the cells. The printing cylinders are usually made from copper plated steel, which is subsequently chromed, and may be produced by digital engraving or laser etching. Gravure printing is used for long, high-quality print runs such as magazines, mail-order catalogues, packaging, and printing onto fabric and wallpaper. It is also used for printing postage stamps and decorative plastic laminates, such as kitchen worktops. 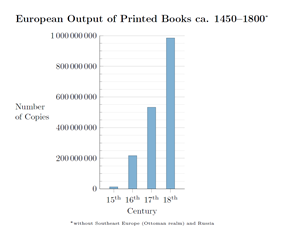 It is estimated that following the innovation of Gutenberg's printing press, the European book output rose from a few million to around one billion copies within a span of less than four centuries. Samuel Hartlib, who was exiled in Britain and enthusiastic about social and cultural reforms, wrote in 1641 that "the art of printing will so spread knowledge that the common people, knowing their own rights and liberties, will not be governed by way of oppression". Both churchmen and governments were concerned that print allowed readers, eventually including those from all classes of society, to study religious texts and politically sensitive issues by themselves, instead of having their thinking mediated by the religious and political authorities. In the Muslim world, printing, especially in Arabic scripts, was strongly opposed throughout the early modern period, though sometimes printing in Hebrew or Armenian script was permitted. Thus the first movable type printing in the Ottoman Empire was in Hebrew in 1493. According to an imperial ambassador to Istanbul in the middle of the sixteenth century, it was a sin for the Turks to print religious books. In 1515, Sultan Selim I issued a decree under which the practice of printing would be punishable by death. At the end of the sixteenth century, Sultan Murad III permitted the sale of non-religious printed books in Arabic characters, yet the majority were imported from Italy. Ibrahim Muteferrika established the first press for printing in Arabic in the Ottoman Empire, against opposition from the calligraphers and parts of the Ulama. It operated until 1742, producing altogether seventeen works, all of which were concerned with non-religious, utilitarian matters. Printing did not become common in the Islamic world until the 19th century. Jews were banned from German printing guilds; as a result Hebrew printing sprang up in Italy, beginning in 1470 in Rome, then spreading to other cities including Bari, Pisa, Livorno, and Mantua. Local rulers had the authority to grant or revoke licenses to publish Hebrew books, and many of those printed during this period carry the words 'con licenza de superiori' (indicating their printing having been licensed by the censor) on their title pages. It was thought that the introduction of the printing medium 'would strengthen religion and enhance the power of monarchs.' The majority of books were of a religious nature, with the church and crown regulating the content. The consequences of printing 'wrong' material were extreme. Meyrowitz used the example of William Carter who in 1584 printed a pro-Catholic pamphlet in Protestant-dominated England. The consequence of his action was hanging. Print gave a broader range of readers access to knowledge and enabled later generations to build directly on the intellectual achievements of earlier ones without the changes arising within verbal traditions. Print, according to Acton in his lecture On the Study of History (1895), gave "assurance that the work of the Renaissance would last, that what was written would be accessible to all, that such an occultation of knowledge and ideas as had depressed the Middle Ages would never recur, that not an idea would be lost". wide format (up to 3' or 914mm wide rolls of paper), as used in drafting and design establishments. 3D printing is a form of manufacturing technology where objects are created using three-dimensional files and 3D printers. Objects are created by laying down or building up layers of material. As of 2012, some companies such as Sculpteo or Shapeways are proposing online solutions for 3D printing. Gang run printing is a method in which multiple printing projects are placed on a common paper sheet in an effort to reduce printing costs and paper waste. Gang runs are generally used with sheet-fed printing presses and CMYK process color jobs, which require four separate plates that are hung on the plate cylinder of the press. Printers use the term "gang run" or "gang" to describe the practice of placing many print projects on the same oversized sheet. Basically, instead of running one postcard that is 4 x 6 as an individual job the printer would place 15 different postcards on 20 x 18 sheet therefore using the same amount of press time the printer will get 15 jobs done in the roughly the same amount of time as one job. Printing terminologies are the specific terms used in printing industry. 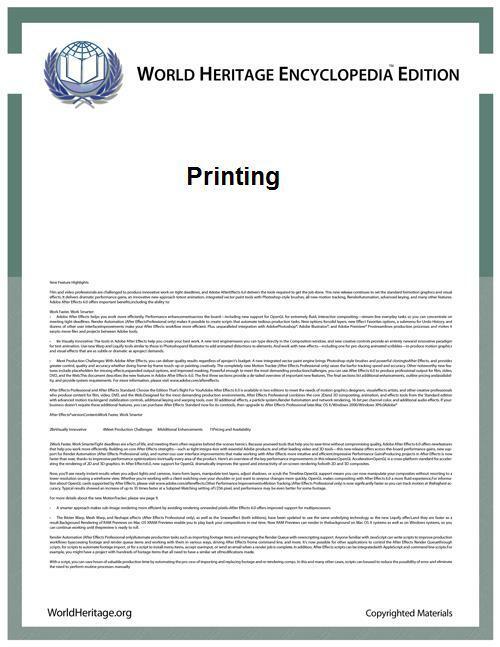 Following is the list of printing terminologies. ^ "Oneline Gallery: Sacred Texts". British Library. Retrieved March 10, 2012. ^ Tsien Tsuen-Hsuin; Joseph Needham (1985). Paper and Printing. Science and Civilisation in China. 5 part 1. Cambridge University Press. pp. 158, 201. ^ A Hyatt Mayor (Nos 5-18). Prints and People. Princeton: Metropolitan Museum of Art. ^ Richard W. Bulliet (1987), "Medieval Arabic Tarsh: A Forgotten Chapter in the History of Printing". Journal of the American Oriental Society 107 (3), p. 427-438. ^ Briggs, Asa and Burke, Peter (2002) A Social History of the Media: from Gutenberg to the Internet, Polity, Cambridge, pp.15-23, 61-73. ^ a b c Polenz, Peter von. (1991). Deutsche Sprachgeschichte vom Spätmittelalter bis zur Gegenwart: I. Einführung, Grundbegriffe, Deutsch in der frühbürgerlichen Zeit. (in German). New York/Berlin: Gruyter, Walter de GmbH. ^ Thomas Christensen (2007). "Did East Asian Printing Traditions Influence the European Renaissance?". Arts of Asia Magazine (to appear). Retrieved 2006-10-18. ^ In 1997, Time–Life magazine picked Gutenberg's invention to be the most important of the second millennium. In 1999, the A&E Network voted Johannes Gutenberg "Man of the Millennium". See also 1,000 Years, 1,000 People: Ranking The Men and Women Who Shaped The Millennium which was composed by four prominent US journalists in 1998. ^ a b Ref: Briggs, Asa and Burke, Peter (2002) A Social History of the Media: from Gutenberg to the Internet, Polity, Cambridge, pp.15–23, 61–73. ^ a b c Meyrowitz: "Mediating Communication: What Happens?" in "Questioning the Media", p. 41. ^ Kipphan, Helmut (2001). Handbook of print media: technologies and production methods (Illustrated ed.). Springer. pp. 130–144. ^ a b c d e Kipphan, Helmut (2001). Handbook of print media: technologies and production methods (Illustrated ed.). Springer. pp. 976–979. ^ a b Kipphan, Helmut (2001). Handbook of print media: technologies and production methods (Illustrated ed.). Springer. pp. 48–52. ^ "When 2% Leads to a Major Industry Shift" Patrick Scaglia, August 30, 2007. ^ "Recent Announcements Show Gains Being Made by PE Industry". Printed Electronics Now. ^ "'"Printable transistors usher in 'internet of things. The Register. Retrieved 21 September 2012. Saunders, Gill; Miles, Rosie (May 1, 2006). Prints Now: Directions and Definitions. Victoria and Albert Museum. Moxon, Joseph (1683-84). "Mechanick Exercises on the Whole Art of Printing" (ed. Herbert Davies & Harry Carter. New York: Dover Publications, 1962, reprint ed.). Stower, Caleb (1808). "The Printer's Grammar" (London: Gregg Press, 1965, reprint ed. ).